The gladiator is one of the most enduring figures of Ancient Rome. Heroic, though of lowly status, they fought vicious duals in large arenas filled with baying crowds. The survivor could be either executed (the famous ‘thumbs down' signal) or spared at the whim of the crowd or the Emperor. Few lasted more than a dozen fights, yet they were a valuable asset to their owners. But how did they fight and how did their weapons and techniques develop? Who were they? 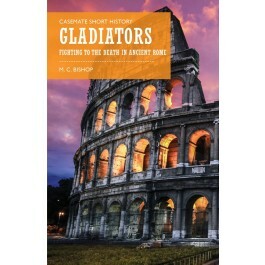 This book gives an entertaining overview of the history of the gladiator, debunking some myths along the way. We learn about the different forms of combat, and the pairings which were designed to carefully balance the strengths and weaknesses of one against the other. The retiarii (with nets) were lightly armed but mobile, the secutores and murmillones protected but weighted down by their armour. Gladiators also participated in simulated naval battles on large artificial lakes or even in the arena of the Colosseum. Although their lives were brutal and short, gladiators often were admired for their bravery, endurance, and willingness to die. They were the celebrities of their day. This book reveals what we know and how we know it: ancient remains, contemporary literature, graffiti, modern attempts to reconstruct ancient fighting techniques and above all the discovery at Pompeii where a complete gladiator barracks was found alongside multiple skeletons tell their story.